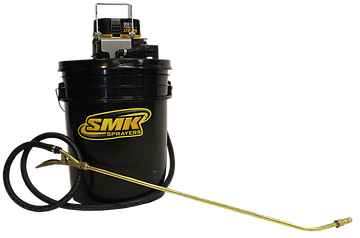 Looking for a Battery Powered Garden Sprayer That Will Allow You To Reach Those Hard to Get Places Without All the Pouring and Pumping? Whether you’re a lawn and garden contractor or a homeowner just trying to get the job done, the hot sun is beating down on you and you’re sweating with every pump as you use a traditional pump sprayer. Or maybe you are using another battery operated sprayer and you have to go back and pour your product into their container (for the second or third time!) and it spills all over the place. What a mess! Convenience is what you are looking for, isn’t it? 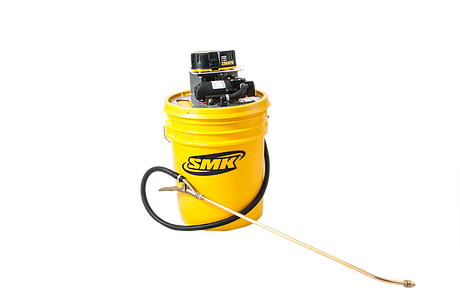 Why not eliminate the hassles of pump sprayers and other battery operated sprayers by simply connecting your sprayer directly to the bucket of the product you are spraying. You can do this with the SMK family of battery operated lawn sprayers. 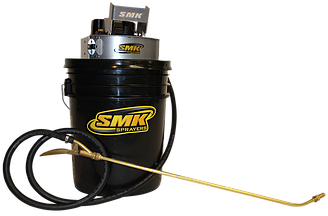 These all-purpose, all around sprayer assemblies can be used for a variety of things like weed control, garden mist, farm & livestock, fertilizers and many more. And not only that, you don’t have to risk contamination since you are using the original product containers! In addition, they are powered by a standard 18 volt DeWalt battery, which you many already have! 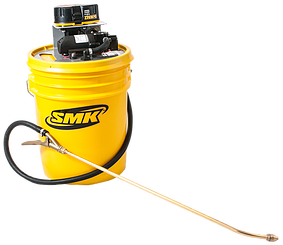 With a variety of models, you can spray water-based, oil-based or other chemicals that give you the flexibility to take advantage of all the benefits of our sprayers, regardless of what products you are spraying. And enjoy convenience by calling us to find out which Battery Powered Garden Sprayer model best fits your needs!